Post subject: Worlds Elim Grid - PRELIMS complete - Who took 2nd...? Here's the final grid for ELIMS Prelims. I'm WAAAAAAY too tired to come to a clear conclusion on who-beat-who and 2nd/3rd/4th, so I'll throw it to the Council to have a look-see. If SWEEPS are considered differently, it changes the way you see it. A 3-team tie-breaker could also be used. the outcome is clearly defined by the tiebreaker priority listed on the chart. who beat who, then total game scores, then playoff. in my opinion, it would be extremely imprudent to consider changing the tiebreaker to somehow include sweep points when there is no need for a tiebreaking game under the current system. one thing... in game 41, rsd and a7 both got eliminated and have zero scores. a7 is listed as 2nd place and rsd is listed as 3rd. how was it determined that one team took 2nd and the other 3rd? if you were to decide that they both tie for second, then rsd would have one fewer rank point and would end up in second place not tied with the other three teams. Mark, the scores from game 21 are still incorrect. We went through this and he shot more than he was hit he could not have scored negative. Remember game 21 was the game that started the three game issue two nights ago. Is the score from calculating the score manually different from what is actually given on the scoreboard/scoresheet? Couple things to point out, we never used a pack named Vortex. Lepper is not on our team, you cannot shoot your own team. It calculated as shooting your own team. Everyone said this is definitely fixed but it is not. Zero's score should have been 540. Our score should have been 5030. Last edited by iM not psycho on Mon Nov 07, 2011 7:35 pm, edited 2 times in total. Is that from the first or second set of scoresheets that were sent out? I think all that stuff was supposed to be fixed with the second set of scoresheets but I dont know for sure. 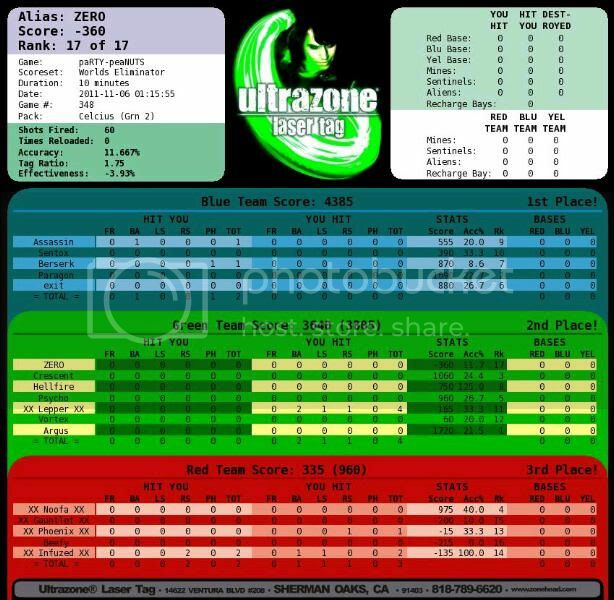 I have both scorecards and they both are incorrect displaying his score as -360.